As you can see, this isn't a typical 3-tired wedding cake. My brother had a small wedding (about 10 of us) at the courthouse and we had a celebration after with cake and champagne. 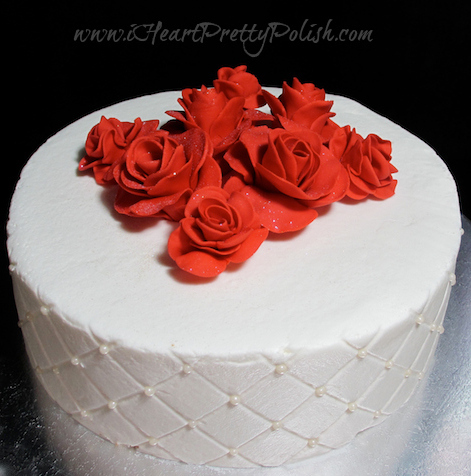 My mom asked me to make a cake for the occasion, so I decided to make a simple white cake with red fondant roses. This is a marble cake with buttercream icing. The diamonds are made with a diamond impression mat and I placed an edible pearl at each intersection. 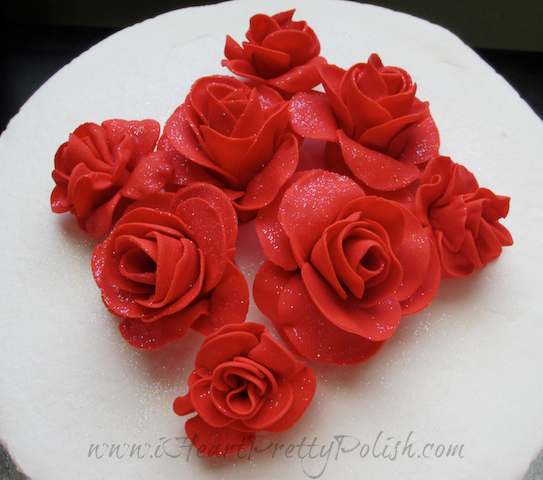 The fondant roses take a little time. A few days before I made the cake, I started constructing them while watching TV and Youtube beauty videos. Each rose took about 10 minutes, but it's kindof fun making them:) They have to dry overnight and become very hard and brittle. Traveling 3.5 hours with a cake in the back was a little scary. I think I need a sign that says "Cake on Board" rather than "Baby on Board" so people know why I am driving like I'm 90 years old. I also sprinkled some edible glitter on top of the cake for a fun effect. I love adding that final touch. If you are new and haven't seen the rest of my cakes, feel free to click the "cake" label at the top right of my page or under the "brands" title. Essie this cake is BEAUTIFUL! I don't even know what flaws you are talking about! I totally agree with you on the "Cake on Board" sign LOL....I wish they made one that said "Cupcakes on Board" that I could put on my car LOL. I really love how the glitter stands out on top of the roses, so pretty! Thank you very much:) Maybe we should invent those signs!? We saved our cake for the year in the freezer and it was sooo good after a year. I couldn't believe it. Ooooh, don't be scared to post cakes like these - this is gorgeous! A really classy and beautiful cake which must have been amazing to share on such a wonderful day. 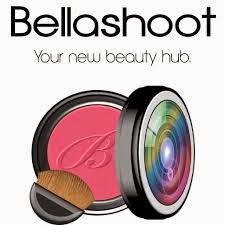 Wow this is beautiful!! It's a gorgeous cake and looks delicious! And congrats to your brother and your family =) I definitely have to check out your other cakes now! I dont see any flaws, i know we are always our worst judges, but this cake is perfection! 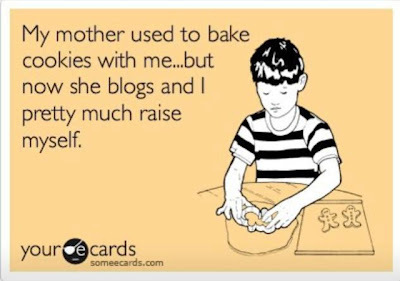 i love your baking posts so much! This cake is lovely! I see now flaws whatsoever! LOL, well good thing you don't see them because they stand out like a sore thumb to me! Exactly what Dani (and well, EVERYONE else) said! 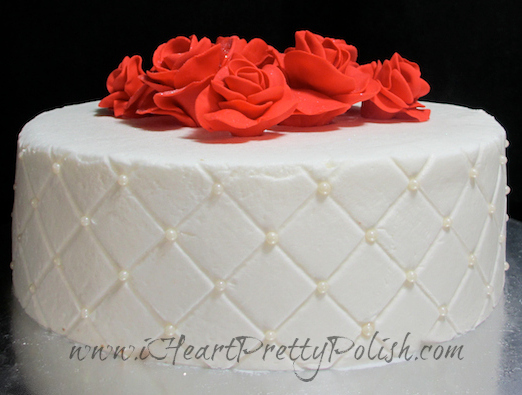 Amazing, elegant, PERFECT cake!!! I love love love the roses and the touch of glitter...makes it look just magical. :-D I really don't see a single imperfection. If I ever were to get married (HUGE, MASSIVE "if"), I'd for sure have you make my cake! Ohhh so YOU'RE the granny I was behind that day! ;) Hehe, just kidding! I wish I'd been able to be in the area so we could've met. :-D Someday. Ahahaha...All those e-cards are so great. I'm guessing my dog feels the same way? I don't think your girls would say that though. Just from the bit I know, you do their nails & play polish guessing games with them. :-) That's special. Well, I dare say you're PRETTY darn safe, because I'm not even looking to date anyone. In fact, I make it a point to be clear about my love of singleness to any guy that expresses the slightest interest. yep, great job tying it in ;) LOL. Well you are a tough cookie! LOL, If I was in a room with you, I would point them out... Thanks for your compliment, I really appreciate it! Wow! That’s quite a special cake for dam & Jen's Wedding. That last picture is so satisfying!! Love your skills my friend. At one of the garden Los Angeles event venues I also would be marrying soon and will prefer having such a cute cake design. I hope that a local cake designer would help me get the exact design.